This is a recipe from a fellow blogger and friend, Frieda. I've been eying these puppies for awhile, since we don't have a Chik Fil A close to us. I made them the other night and WOW! The set up and cooking is pretty fast. However, mine became quite the family event. 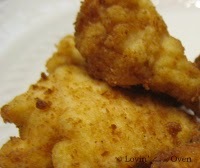 I had my 5yr old McKenzie dipping the chicken, my husband frying them, and me helping dip and then moving on to dessert. Our kitchen really isn't big enough for all of us but it was fun! We made almost the whole batch- I did 3 chicken breasts cut into strips- before sampling them. When we did, we had to just close our eyes and go "mmmm". We dipped them in a variety of sauces, nothing special, just honey, ketchup, and ranch dressing. So, yes, they are fried. But, they are so, so very good! Combine flour bread crumbs, salt, baking soda, onion and garlic powders and paprika. Stir well. In a separate bowl, beat one egg. Take 1/4 c. of milk marinade from the chicken and mix it with the egg. Fry in small batches in 357 degree oil for 1-1 1/2 minutes. These sound so yummy! I LOVE the nuggets at chick-fil-a.